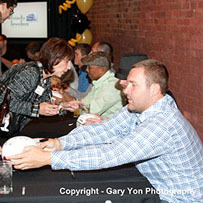 I have added some photos of Ben from Heath Miller’s “Bid for Hope” event which took place on October 18th at Bosa Nova. Also in attendance were teammates Brett Keisel, Hines Ward, James Farrior, Jeff Reed, Keyaron Fox, Matt Spaeth, and Max Starks. Proceeds from the event benefit the Under Forty Breast Cancer Study. The photos were taken by photographer Gary Yon, and are courtesy of Diana Napper, founder of the Glimmer of Hope Foundation. You can see the photos of Ben here. You can see all the photos here (there is also information on purchasing your favorites). You can learn more about the Glimmer of Hope Foundation here.